You can easily get your team together for web meetings using Ginger Domain’s audio and video conferencing software. Hence, this can help you in saving your time and travel expense. Effective sales presentations, interviews, and all kinds of online meetings can be facilitated owing to the robust features of the video conferencing software. Presenters and participants can test for problems with Internet connectivity and compatibility with the help of our teleconferencing services before video conference begins to ensure that there is no interruption during the actual conference. This enables the assurance of minimum glitches and maximum productivity with our state-of-art conferencing software. 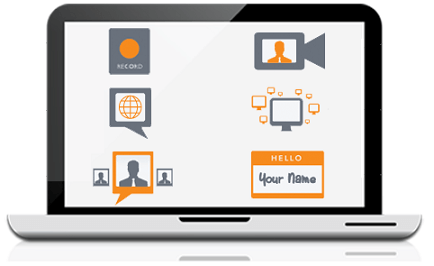 Screen sharing, whiteboard presentations, video viewing, file and screen sharing, and collaborative online meeting tools are some of the features of Ginger Domain’s video conferencing software for online meetings.They become easier for both the presenters as well as participants. Also, the interface enables you to handle the invitations with ease. To join the meeting, the invited participants simply have to click the link without any requirement of downloads. Our video conference software delivers its connection to each participant from the server nearest his location with cloud-based technology. All the features of Ginger Domain’s video conference software can be experienced in real time by the participants for a smooth online meeting. It’s a simple procedure wherein you just have to enter the details of the meeting along with the email addresses of the attendees. Participants will than receive an email having all these details as well as the link to join your meeting. It’s easy to share anything on the screen simply by displaying the document. With this feature in our services, you can share documents which include PowerPoint, Excel, Word and web pages. If you want speedy performances when it comes to PowerPoint and PDF documents, you can easily upload such documents with our sharing feature. Ginger Domain provides screen sharing for applications in such a manner that you can access these documents in the future, too. With our conferencing services, 6 people can video conference at the same time. We understand that using webcam adds that personal touch. You just have to press record and leave the rest to us. We offer the feature of recording of the screen sharing as well as audio, be it a conference call alone. You can share these recordings simply by posting a link. We help you to keep your audience engaged by the means of either text chat, Q&A sessions or live polls, etc. There is no place constraint. The attendees of your meeting can watch your video, chat, listen and view your meeting simply on their iPad or Android tablet. You can keep a track of important decisions, information, and plan of actions discussed in the meeting. The notes will then be emailed to you and your attendes after the meeting is over. You can choose to share your documents with attendees immediately after you have finished presenting. A handout that attendees can download and keep will surely leave a lasting impression.